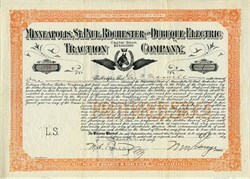 Beautifully engraved certificate from the Minneapolis, St. Paul, Rochester and Dubuque Electric Traction Company issued in 1913. This historic document has an ornate border around it with a vignette of company's name and a Dan Patch Air Line Logo ( Horse, Wings, Horseshoe and Crown). This item is hand signed by the Company's President ( Marion W Savage ) and Officer and is over 106 years old. Just the mention of Minneapolis, St Paul, Rochester & Dubuque Electric Traction Company is enough to warrant a �Would you repeat that again, please � more slowly ?� query. This novel venture was the creation of one Marion W Savage, boss of the mail order International Stockfood Company, based in Minneapolis in the very early part of the twentieth century. He was a wealthy, devout, no-drink, no-smoke man who once ran in a Minnesota gubernatorial race. Mr. Savage also owned a horse-breeding farm some twenty miles south of the Twin Cities of Minneapolis � St. Paul, with Dan Patch being his master�s pride and joy. In that period, harness racing was a big sport, and Dan Patch a most famous pacer horse. In Dan�s ten years of racing, he was never once surpassed. From 1900 to 1910 he held 14 world records, each time beating his previous ones. In 1906 at the Minnesota State Fair, the stallion did one mile in 1 minute 55.25 seconds, a record that stood for over fifty years ! Savage was convinced that the idea of constructing a rail line from town to his 750-acre estate would not only attract attention and build his stockfood business reputation, but could also support passenger travel to more southerly Minnesota locales and even creep into northern Iowa. He felt visitors would be attracted to his farm to view Dan Patch and the other pacers. Incorporated in September 1907 under the laws of Maine, the dream road was projected 135 miles to Rochester as a common carrier, with a future extension into Iowa. Its northern terminus would intermingle with Twin City Rapid Transit Company rails in Minneapolis. It was in Dubuque that Savage had founded his stockfood enterprise some years before. Capitalized at $25 million, the company�s shares were sold in Common ($15 million authorized, green & black in color) and 6% Preferred ($10 million authorized, orange & black). Many farm residents in the area to be served by the new railroad bought shares in the speculation. At one point in time, there were over 8,500 shareholders on record ! Billed as the �First Gas-electric Railroad in the World�, its flyers proclaimed : �The Old Way � The smoky, dirty, uncomfortable train, versus The New Way � The clean, comfortable, electric train�. �Smokeless� gasoline-electric propelled cars were employed, new for their time, and forerunners of our modern day diesel-electric locomotives. It was at first primarily a passenger operation, though during World War I�s freight traffic increases, some steam locomotive power was utilized. Savage held two private railroad cars � one for him and his family, and a converted baggage car for Dan Patch, which he leased from the Chicago & North Western Railway. The horse palace car was painted spotless white and its sides bore exquisite gold letterings and designs. A team of white-uniformed grooms traveled with the horse�s vehicle, whose tours took them about the USA and Canada. International Stockfood feed sacks read : �If it�s good for Dan Patch, it�s good for your horse�. Adding another superlative, the bulbed dome atop the four-winged horse barn displayed : �The Four Greatest Stallions Ever Owned By One Farm�. Some years later, another idea was conceived. Near Lakeville and along Prairie Lake, Savage purchased property, with a renamed Lake Marion. A large existing structure was modified into a hall for weekend dances. A clubhouse, bathing beach, aerial swing, chute-the-chutes, and a miniature railway were added and the spot became known as �Antlers Park � reached via the Dan Patch Electric Line�. It became a very popular amusement zone. The outcome of Savage�s scheme was that the route only extended as far as the town of Northfield � about forty miles below the Twin Cities. Through the years, however, extensions were added in the more northerly portions, trackage rights acquired from other railroads, and the Dan Patch Line captured more business. In July 1916, tragedy struck the horse farm, in that twenty-year-old Dan Patch died in the big barn, claimed to have been a victim of overfeeding. A dejected M W Savage also passed away very shortly thereafter. Following Savage�s demise � the two prime movers now gone � interest waned and in 1918 the line went into receivership and was sold to the newly formed Minnesota, Northfield & Southern Railway. Later, the Soo Line Railroad took possession, and even more recently, the old Dan Patch Line�s path is within Canadian Pacific Railway jurisdiction. The gas-electrics, incidentally, saw service up to World War II days. Befittingly, the Savage renown is not forgotten, as it today remains a station name where the Chicago & North Western (today�s Union Pacific Railroad) crosses the old Dan Patch operation. If P T Barnum was known for his flair of publicity, then M W Savage surely ran a close second! Special thanks to Robert O Greenawalt for the History.